Roger and Evelyn Crawley opened North Louisiana Trade Exchange (NOLATEX) in 1991. The company provides barter services in the Monroe/West Monroe area. 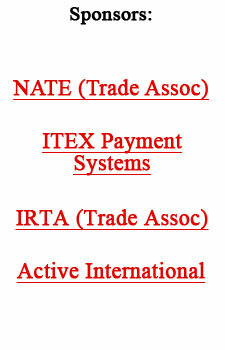 NOLATEX is a member of the National Association of Trade Exchanges (NATE). An assortment of Camille Beckman bath products, with perhaps some additional amenities, such as candles or angel figurines. 12 ready-to-build single-family residential lots. The lots are located in Doe Valley, which is a 2,636-acre gated golf course community with a 360-acre private lake in the Louisville, Kentucky metro area. The builder value of the lots is in excess of $480,000. The funding may be structured as a sale with a one year option back to the seller to repurchase the lots for $275,000 increased at 13% pre annum prorated to the date of exercise of the option. However the option price will not be less than $294,250. The sale with a buy back option is intended to offer an additional level of security over the mortgage format. $20,000 of the $275,000 purchase price is trade. Contact Roger Crawley for additional info. The whole subdivision of Doe Valley in Brandenburg, Kentucky south of Louisville can be bought for $20,600,000.00 with $200,000 in trade dollars. The seller will carry back $6,000,000.00. For complete description, plats, etc., contact Roger Crawley. Cookies with your logo on them. Edible Image Cookies. We can take your picture or logo and make a cookie out of it! Perfect for holiday party favors of any shape or size from the most simple celebrations to holiday office promotions, trade shows or board meetings. Best of all--it is 100% edible & delicious!!! Deer attractant for all your deer hunting members. See www.monstermashfeed.com for details. 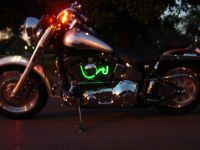 Harley Davidson Neon Hot Wires. Spark plug wires are neon lights. They come in Blue, Orange, Purple, Red, and Green. See the website www.neonhotwires.com. for information and the applications. Price $299.95 Same as cash. Call Roger Crawley at 318-327-7555 to order. Select from a variety of coffee, teas, muscadine juices, sausage, cheese, crackers, dips, cheese straws, peanuts, pretzels and other gourmet products. LOUISIANA shaped baskets filled with Cajun and other foods indicative of Louisiana. Wheelchairs, hospital beds, nebulizers, respiratory supplies, gauze, bandages, tapes, needles, syringes, blood collection products, wound care and diabetes care supplies. Go to their website, www.aossmedical.com, to see their online catalog. Do not buy online as that will be cash. Print out your shopping cart to place an order either by phone or fax. Call Roger Crawley for info or fax your order to 318-327-7553. Shipping is cash. Banc members, purchase this chopper now for fun this summer. A few of the many features are: 125cc Honda style engine, E22 head, Custom dragon exhaust pipes, Electric & kick start, Horn, Headlight, Battery, Spider intake, Custom chrome webbing on the tank & fender, Metal motorcycle gas tank with key lock on cap, Webbed seat, Wave style rotors, Hydraulic front & back disc brakes, Webbed rims, 4 sp. auto transmission, Stock speed is 65 mph with lots of room to make it go faster, Front & rear suspension & will hold a 350 lb. person. This chopper is no joke. It's over 7 ft. long & will not fit in the back of most pick-ups without the tail gate down. It is being sold for off road use. The price is $1500, full trade. Shipping is cash. Call Roger Crawley at the North Louisiana Trade Exchange to order. Phone 318-327-7555, or e-mail rogercrawley@nolatex.net. Choose from a large selection of over the hill products for your 30, 40 & 50 year old friends; arranged in a black coffin-shaped box or wicker basket. Currier & Ives decorative tins filled with your choice of plain, buttered, seasoned in 16 different flavors, caramel popcorn or a combo of any of these. Priced from $10.00 to $35.00. Shipping cash.